If you have yet to watch Neal Stephenson's pitch for CLANG, this story contains spoilers below. My first, briefly considered reaction at the 3:04 mark in Neal Stephenson's excellent Kickstarter video, is that this celebrity guest star was an impersonator. That's the nature of the Internet. I wasn't aware these two had any kind of a relationship. But then it seemed to make sense that they would know each other. I sent off an email and quickly got a reply. Yes, that's Gabe Newell, the Valve co-founder and boss, pounding away on a crowbar, yet again poking fun at the angst over Half-Life 3's interminable development time. Not only that, he really does know how to handle the tools of a smithy's forge. In fact, that's his own equipment in the video. "Neal and I met a couple of years ago," Newell told Kotaku. "We had a couple of friends in common, and they decided they wanted to smash us into each and see what happened. I am a big fan of what Neal is trying to do with CLANG, so he asked me to put in an appearance in the video." While Newell hasn't yet pledged his Kickstarter support, he's not the only one at Valve who has visited Stephenson's Subutai Corporation, which also is located in the Seattle metropolitan area. "We are happy to help Neal and his team out," Newell said. "They've been to our offices a bunch and several people at Valve attend the sword training they do." And if Newell looks like he knows what he's doing with that anvil and hammer, he does. "I have a forge and a CNC mill in my garage," he said. 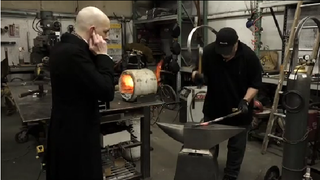 "The anvil in the shoot is mine, and is made by Nimba Anvils here in Washington state. The hammer I was using was made by a friend of mine in Arizona, Tai Goo."